810 pages | 406 B/W Illus. Maintaining a balance between depth and breadth, the Sixth Edition of Principles of Polymer Systems continues to present an integrated approach to polymer science and engineering. A classic text in the field, the new edition offers a comprehensive exploration of polymers at a level geared toward upper-level undergraduates and beginning graduate students. All chapters have been updated and out-of-date material removed. 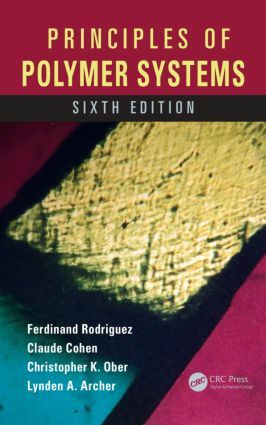 The text contains more theoretical background for some of the fundamental concepts pertaining to polymer structure and behavior, while also providing an up-to-date discussion of the latest developments in polymerization systems. Example problems in the text help students through step-by-step solutions and nearly 300 end-of-chapter problems, many new to this edition, reinforce the concepts presented. Ferdinand Rodriguez is professor emeritus of chemical engineering at Cornell University, Ithaca, New York. He was the author of the first edition of this textbook. His research in the field of polymers resulted in over 150 journal articles, while he was on the Cornell faculty. Many of these were presented at meetings of the American Chemical Society, the American Institute of Chemical Engineers, and the Society of Plastics Engineers. In retirement he remains active in Cleveland chapters of these organizations. Claude Cohen is the Fred H. Rhodes professor of engineering at Cornell University. His research interests focus on the structure–property relationships of elastomers and the testing of theories of rubber elasticity and fracture. Previous research efforts were devoted to the study of suspensions and their applications. He was a co-principal investigator of the Cornell Injection Molding Program initiated under a grant from the National Science Foundation (NSF) and supported by an industrial consortium until 2000. Christopher K. Ober is the Francis Bard professor of materials engineering and has served as chair of the department of materials science and engineering. More recently he has been associate dean of engineering for research and graduate studies and the interim dean of engineering at Cornell. He has pioneered new materials for photolithography and studies the biology materials interface. An early contributor to the investigation of self-organizing systems, he studies liquid crystals and block copolymers. More recently he has begun to study nanoparticle materials. Lynden A. Archer is a professor of chemical engineering at Cornell University and the William C. Hooey director of the School of Chemical and Bimolecular Engineering Ithaca, NY. His research focuses on transport properties of polymers and polymer–particle hybrids and their applications for electrochemical energy storage. He is a fellow of the American Physical Society, the recipient of the 2013 National Science Foundation Special Creativity Award from the Division of Materials Research. Archer has published over 160 scientific papers on physical polymer science and nanomaterials science and applications, and the 2014 Nanoscale Science & Engineering Forum Award from the American Institute of Chemical Engineers.